Cat Games - Cat And Kitten Play! What are some good cat games? 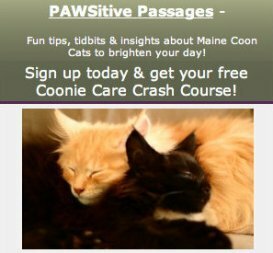 They are creative, energetic, fun things to do with your cat or kitten! They are the best cat toys and kitten toys. They are crazy kitten games. And never forget the catnip. Let's have some fun! When it comes to cat games, kittens are in a league of their own. Kittens are little balls of energy. They don't even need catnip to be wild. Why does your kitten play so much? Just watch a mother tiger or lion with her cubs on a nature show. During that time, the playful cubs are learning from their mother all the time. They are preparing for a life on their own, where they will need to survive on their own. So kitten play is practice! Just watching those adorable kittens stalk and attack each other's tails is so entertaining. Kittens are hard-wired for these cat games. And, our domesticated cats and kittens behave in just the same way! Some things just run in the family! 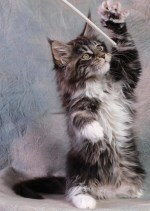 Of course, many cats remain playful during their entire life. Then you'll need ideas for cat games for years to come. The best cat toys and kitten toys are ones that get your kitten moving, shaking and jumping! Playing these kitten games with your little one keeps him happy and healthy. It satisfies his instinct to "play hunt". And playing kitten games is a great bonding activity. A cats favorite prey is small animals. Birds, mice and other rodents. So the best cat toys and kitten toys will resemble these not only in appearance but in motion. A little brown mouse that blends in with your flooring and makes no noise may not attract your cat or kitten. (Unless, of course, it's filled with catnip!) Go for mice that make a noise, like a rattle. And it's perfectly fine for the toy to be brightly colored! Cats don't perceive color anyway. A bright pink rodent toy may be just what he wants. Cat and kitten toys are expensive! There's no need to spend an arm and a leg to play some great cat games. Some of the best cat toys are homemade cat toys. Boxes - Cats love to hide. They will go into just about any small space. Then they can scope out the action, stalk their prey (maybe your feet!) and pounce when ready. Any box will do. Get creative with cutting out an opening and maybe a peephole. A flashlight This is a great alternative to buying a specially made laser light. You can move it around the room just right, getting your cat or kitten to run, jump and pounce to his hearts content! Playing cat games made from your own cat toys is fun and easy. Your cat will enjoy them just as much as the store bought cat toys. Put a few things together and watch your cat play with your creations! This is our shopping section, full of our Top Picks for the best cat toys around. Want to know what's hot? 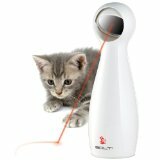 What cat toys are selling like hotcakes and getting the best reviews? Look no further than Big Cat Toys. Everyone loves to see a cat play with catnip! Catnip is the king of cat toys. You can grow your own catnip, buy a catnip filled toy, or get some high quality loose organic catnip to fill or refill your cat toys with. Some people wonder about the safety of their cat playing with catnip. It's perfectly safe! To read more about catnip and see more fun toys, visit our article entitled: What Is Catnip? Overall, it's a safe and healthy choice. Go ahead and let your cat play with catnip to his hearts content! 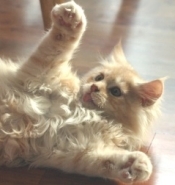 Have you ever wondered what makes your cat react the way he does around catnip? And, why don't all cats act the same? What exactly is catnip, anyway? This section will explore the wonderful (to your cat!) world of catnip. Usually, we don't need much inspiration when it comes to cat play. They know what they like. Jumping up in the air after a dangling cat toy, chasing a light, climbing a cat tree at top speed, tearing up a catnip toy, these are some of their favorite things! Let the cat games begin!